Every now and then, the "Wave Cam" takes a snapshot of some indiscriminate wave and or surfer that causes me to sit up and take note. Last Thursday (Jan.19th) for instance, was one of those times. For you see my fellow surf friends, not once, but twice, during the morning while I was working, I saw two images that caused me to switch gears and take note of what was happening just down the street. 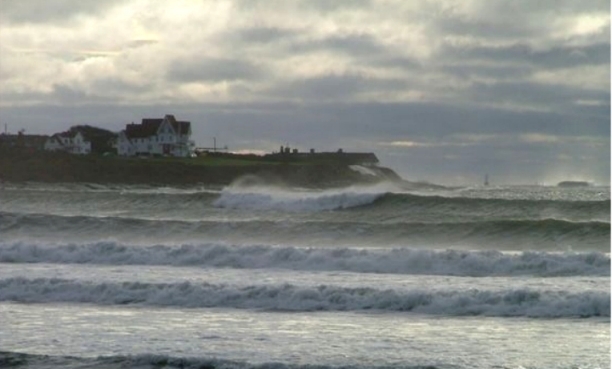 The day before, the wind howled up to 50-60 knots. I mean, it was "Howling For It's Darling Windy!" Anyone who follows the weather knew the next day would be good. It was. Albeit, the wind switching to WSW had done a number on the size. 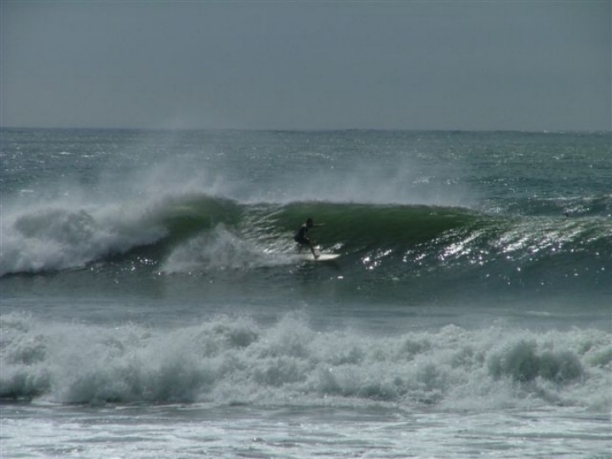 But, there was still a head high swell pushing through the stiff offshores. I guess it was right around 9:00AM when I spotted the first of two images from the "mindless" wave cam. 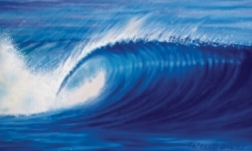 It was a perfect image of two waves and they were both reeling. 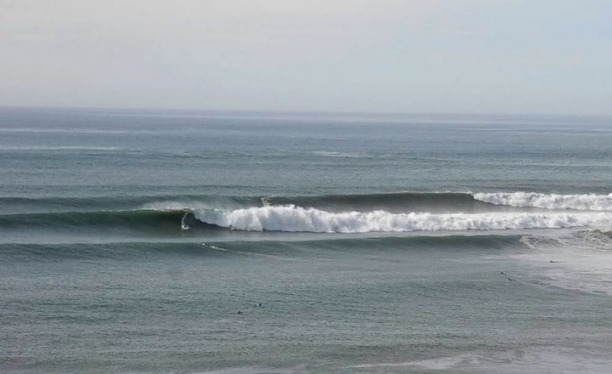 Two right handers showing a super hollow section that only a surfer can appreciate. I remember saying to myself "Look at that. The wave cam just took a perfect photo of a perfect set." Then I wondered, if anyone else saw it. Of course, 10 seconds later, it was gone. For good. Look, I know the "Wave Cam" is just that. A camera set to snap a photo every 10 seconds. There's no rhyme or reason to it's content. It's set to take that photo at the exact angle, regardless of time of day, or weather conditions. A Mindless machine. 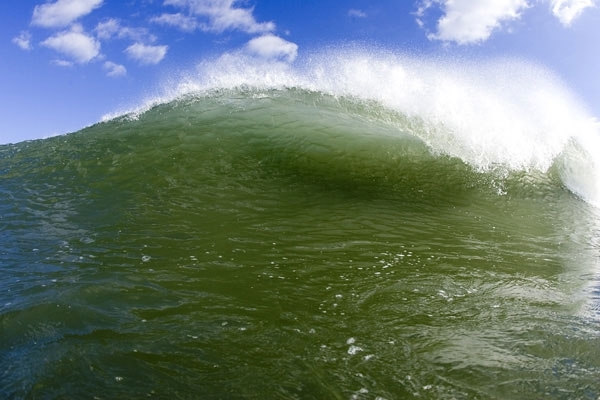 It's just that sometimes during a clean swell, it takes a photo that makes us all take note. It was only a short while later that the Wave Cam took another photo that caused me to shut down the shop for a while. It was an image of a lone surfer dropping into a solitary peak. A beautiful mindless photo of a "real time" event. It dam near took my breath away. ...He said he could. Wow! That's unreal! I then put in a request that he get me some images and I would give the wave cam it's very own gallery. It would be like a Man vs Machine photo gallery. Is this getting too heavy for some of you? Tell me what you think. Would any of you like to see what the Wave Cam has in it's storage files? Maybe I was a bit premature on the Photo of the Year Award a few weeks ago. Maybe... the ULTIMATE Photo of the Year is still on the Wave cam hard drive. 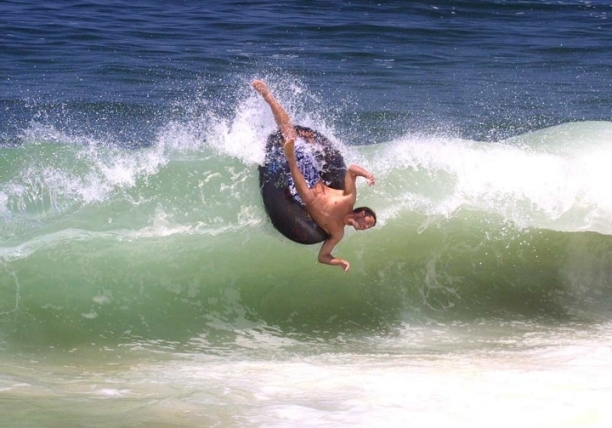 You don't think you were the first "Surfer" to ever do this do you? 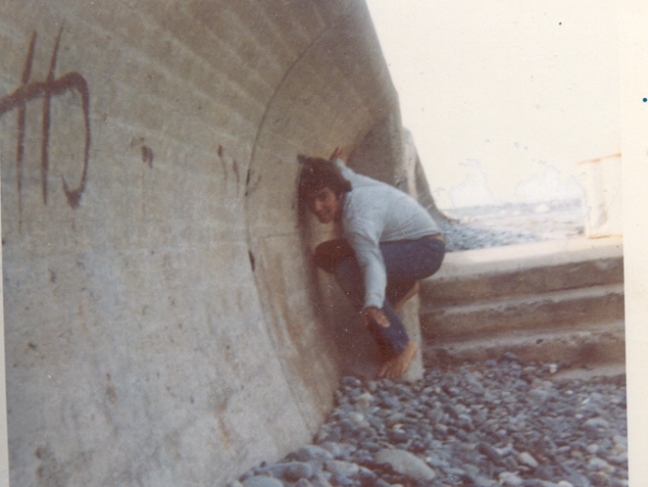 Long before you stopped and ducked under the cement lip to pretend you were getting shacked, surfers have been doing this since they erected that slab of cement. Like Vince here. He could hardly pass up walking by that pitching lip without stopping for a quick head dip. Still, if you haven't done it...what are you waiting for? The next time you find yourself walking by on the way out to another session at the Wall, pull in. While I was out Surfing that popular left point break with a handful of strangers on Thursday, I couldn't help thinking about what some of these people did for work. I mean, how is that there's always someone out surfing every swell all year long? Are there really that many irresponsible people (like myself) out there? What kind of jobs do they have? Part time? Students? Are they business owners? Work the night shift? Are they out surfing because they called in sick? You know dam well some of them lied to someone about what they had to do that day. And it's not just the men. I see women out there as well. I saw one woman the other day walking the length of the Wall in a snow squall with a heavy Longboard. I guess it's all part of the "Rebel" image that Surfers used to have. Apparently, that image is still alive and well. And don't worry guys...I won't rat you out to your boss if I happen to run into them. But only if you give me a wave (of my choosing). You know, part of doing this column is not knowing what is going to show up in my mail box each week. Most times, I'm the first to see the images that my squad of Photographers send me. Like, when I see it's from Nick LaVecchia ...I know I'm getting some "quality images". Same with Nacel, Nichols, Carden, Wade, The Phantom and a host of others. Seeing these images for the first time is a privilege that I don't take lightly. I'm always excited because, I know what you (yes you), want to see. And I can only imagine what it's like for you guys. Sitting in your office, sipping on the Monday morning Java, or at home on the family PC when you dial in the Pic of The Week. I imagine that some of you call over some coworkers, or some family member and point out a photo of interest. My hope is that whoever you show the page to, responds in a favorable manner. "Whoa, I didn't realize you guys got waves that good in New England." To which you reply. "Yea, and this is not even a good day." 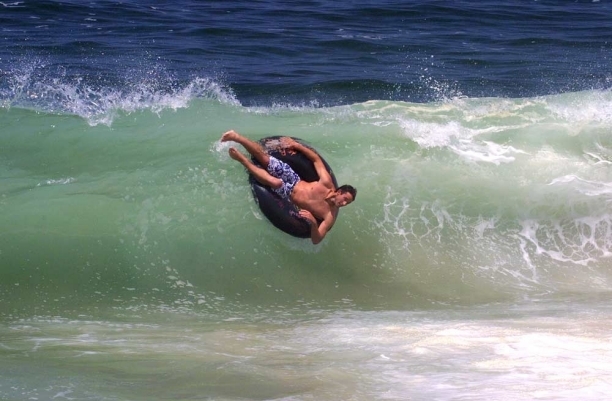 Imagine my surprise this week, when I downloaded some images from John Carden and found not one, but two images of me at the aforementioned point break. That, was a surprise to say the least. First of all, I was not aware that anyone was even snapping a photos, let alone of me. 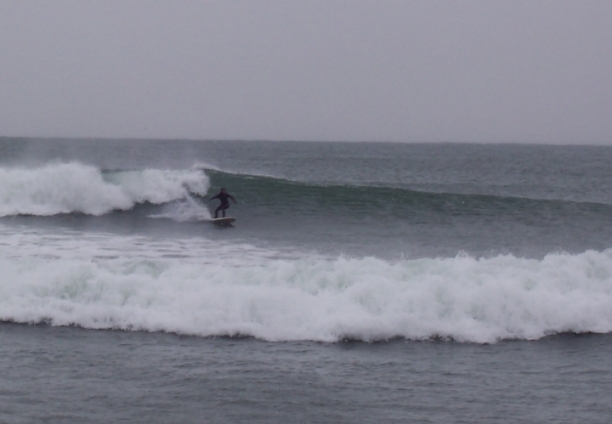 And secondly, I happened to actually get a few nice waves. So I guess, I felt like you guys do when you see a photo of yourself surfing on the Pic of The Week. Of course I had a moral dilemma to deal with. Do I put a photo of myself up? Would my readers think me too vain? Or, should I look at the quality of the photo and content and make a decision based on that? Well...I chose the latter. I thought the pics were worthy of your judgment and John's talent. So I posted them. Good Luck to all the teams in the NFL Playoffs! (God I miss the Patriots). Happy 14th Birthday Kody Grondin. As always my friends...Pray for Surf. Pray for Peace. Surf For Fun. These are the photos I was mentioning above. Truly a surprise for me. The art of grabbing the rail? Hardly, more like I was experimenting when Johnny C snapped these two shots of me. Unknown Goofy foot from the same session at the same break. 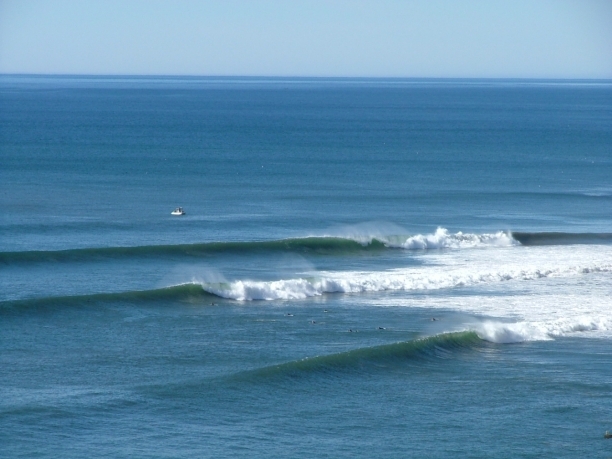 Same day as the photos taken above only a slightly different size and perspective from two different Cali breaks. I'd tell you where, but the Phantom would have to hunt you down and kill you. 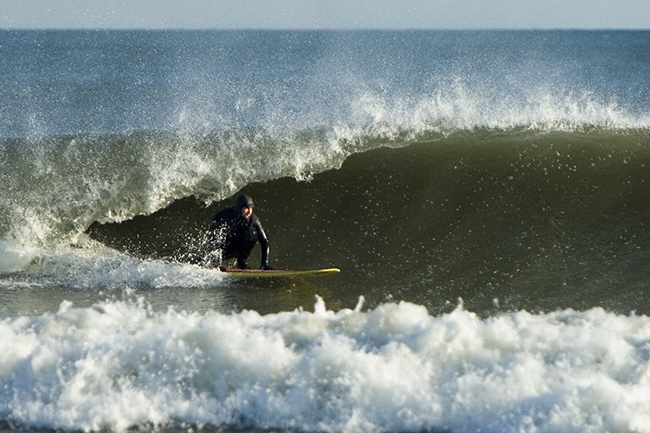 Surf dad Tim Moore sent these two pics in of his two sons surfing the wall from last weekend. Pat is the Goofy foot and Brendon is the regular foot. What a cool dad taking photos of the boys. New Englander Scott Sousa sent these two in from last Fall down south. Today 2006 PARTING SHOT- This is Gonna Hurt! What's the word we're looking for? Oh NOOOOOOOOOOOOOOOOOOOOO!